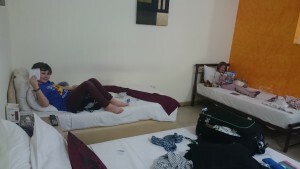 We safely arrived in Ghana and are now at the Paloma hotel in Accra. The rooms are huuuge, we would all 10 fit in here if we wanted, but for now it’s just me and the 2 youngest while the others have other rooms. The flight has been turbulent, but good. Ofcourse we all watched tons of movies on the plane, so nice to all have our own in-flight entertainment system! Tomorrow we’ll leave on the bus to Nsoatre after breakfast, looking forward to arriving there! all 10? Heb ik nu al wat gemist? We zijn totaal met zn 10en ja. Wij (5), mn ouders (2), vrienden (2) en de manager vh weeshuis.